Do you believe everything that comes into contact with your skin should be as gentle, pure and natural as possible? 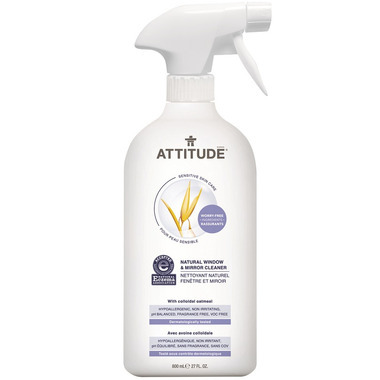 The ATTITUDE Natural Window & Mirror Cleaner Sensitive Skin Solution product line, is specially designed to give a streak-free finish to windows and mirrors, without irritating skin. Enriched with colloidal oatmeal, our Natural Window & Mirror Cleaner is non-irritating, protective, soothing and hydrating. Free of SLES/SLS, and other irritants. I went on a bit of an Attitude products buying spree and I have to say this stuff works just as well as Windex and I feel better that the ingredients are safer and that it's a Canadian brand! Will continue to buy.